A file image of the first RAAF KC-30 refuelling a Portuguese F-16. 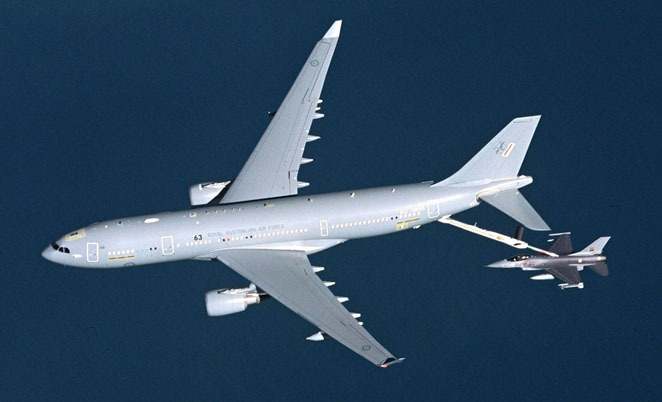 An Airbus Military A330 Multi Role Tanker Transport (MRTT), one of five on order for the RAAF as the KC-30A, suffered the partial loss of its air-to-air refuelling boom over the Atlantic Ocean on January 19. The incident happened while the first of five KC-30As bound for the RAAF – and the first A330 MRTT development aircraft – was conducting a refuelling currency mission with Portuguese air force F-16s. Sources say preliminary reports suggest the boom’s probe snapped off near the F-16’s receptacle, causing the boom to spring up and strike the underside of the KC-30, possibly snapping off one of its two guiding fins and causing it to oscillate wildly until it snapped off at the pivot point. The boom departed the aircraft and fell to the ocean below. Fortunately, both the tanker and the F-16 recovered safely to their respective bases with no injuries to the crews of either aircraft. Damage to both aircraft is currently being assessed, while investigations by Airbus Military and Portuguese air force officials have begun. RAAF Directorate of Defence Aviation and Air Force Safety (DDAAFS) officials are already on their way to Madrid to join in the investigation. It is too early to tell whether the incident will have a further impact on the KC-30’s delivery schedule, although Airbus Military has told media that the incident should not affect the handover of the first two KC-30s to the RAAF, which had been scheduled for late December. The first KC-30 had been due to enter a period of maintenance before delivery to the RAAF, while it was the second and third KC-30 airframes which were due to be the first handed over to the RAAF. RAAF deliveries are currently running more than two years behind schedule due to development delays with the boom, and issues in writing the aircraft’s comprehensive technical publications. The RAAF is understood to be willing to take delivery of the first two aircraft without an operational boom, as the aircraft’s substantial airlift and wing-mounted hose and drogue refuelling pod capabilities are more urgently required, and with the retirement of the F-111, the RAAF won’t operate a boom refuelled aircraft until its first F-35 JSFs are delivered. Saudi Arabia and the UAE have also ordered MRTTs in a similar configuration, while Airbus parent EADS is bidding the aircraft for the USAF’s KC-X tanker program. I think we need to wait for the results of the investigation as this could very well have been caused by the F-16 pilot or boom operator. It was uncommanded boom extension, software error. Does not surprise me one bit. obviously Paul & Greg work for Boeing…No-one knows the cause yet, and making inflamatory statements like those does not help one little bit! Greg, it happened at about 4am Sydney time on the 20th, and not even Airbus knows the cause yet. How can you? Note that Boeing is designing a new boom for the K-X program, so we do not know what gremlins that will face if the K-767 is selected. What you say is not correct re RAAF boom aircraft. The KC-30/C-17/737AEWC all take the boom. Training on these is needed. I was told by one the USAF exchange pilots that the USAF have a couple of booms snap off each year. It is just one of those things that happen and it was only a matter of time before it happened on with a KC-30. It has nothing to do with the aircraft type. It is just one of the dangers of air to air refueling. Did they ever determine what happened to the A330 that was lost over water? Given recent events I’d say Greg’s diagnosis is highly probable. As a matter of safety, boom parts are meant to shear. There are too many variables when two independent objects are coupled together, not to have that ability. Otherwise it would have catastrophic consequences. Maintenance checks are conducted to check the boom due to the movement that occurs. Interesting to find out what occurred. But more important is their all still alive. I just love the speculation that has come about. The world is full of experts. I have over 6,000 hours flying on Boeing made tankers. I have 960 Hours on the Boeing KC-97, the reciprocating engined Tanker and the rest on the Boeing KC-135 Jet. Retiring as a Senior Master Sergeant (E-8) In-Flight Refueling Supernatant I have witnessed and utilized the safety redundancies designed into the Boeing systems. I flew twenty-one years in Boeing products and consider them superior. I instructed for five years at the KC-135 Combat Crew Training School. I was selected to be the initial cadre Systems operator by Strategic Air Command while the first one was being built but, Air Force deselected me and manned the position with a flight engineer. My major career disappointment. As a quality engineer I helped implement ISO 9000 Quality Management at the (McDonald Douglas Now) Boeing Helicopter Plant in Mesa AZ. I also implement ISO 9000 Quality Management System at Simula Safety Systems in Tempe, the maker of the Seats for the Boeing C-17 Cargo plane. I implore you to buy Boeing, buy American, Keep America employed! The KC-135 first flew in 1957 and is still the work horse. The air force needs Boeing reliability. Ray, thank you for your comments and service. Just because Airbus had achieved dominance in commercial market share doesn’t translate automatically into building better military products. You are absolutely right when you say experience still counts in these matters. I have flown on both the KC-135A and KC-10A as a line crewman and Instructor Boom Operator. What are they talking about in this article? In the first paragraph, it says that the Nozzle broke off and then the second that a total boom loss was experienced. Someone stated earlier in the comments that a boom falls off 1-2 times per year in the USAF…That is COMPLETELY FALSE!!! What DOES happen MAYBE once a year is the nozzle that is inserted into the recepticle of the receiver can become overstressed and break off. There are sheer bolts that prevent the boom from being overstressed to the point that A) The nozzle dosen’t disconnect and B) The boom dosen’t break off completely. It is a VERY rare event that the ENTIRE BOOM breaks off (I have over 22 years and 5,000 hours and I’ve NEVER heard of the boom completely seperating from the aircraft) I have just completed a masters paper on the competition…and I must say with all honesty that I went into the paper with an open mind as to which jet would fare better. The Boeing product gives you more bang for the dollar in all aspects of the competition EXCEPT the amount of cargo and passengers that can be transported. What alot of the USAF leadership has forgotten is that we are replacing a TANKER…and the repalcement needs to be a TANKER first…not an airlifter with a tanking problem. Just to give you an idea…the A-330 footprint is LARGER than a KC-10 by about 7,000 square feet, but is only giving you 45,000 more lbs of fuel than a KC-135. (Max fuel for each is as follows: KC-10: 340K, KC-135: 203K, KC-30: 245K) And that was just the tip of the iceberg. And just so everyone knows…the Japaneese SDF flew their KC-767 in a recent exercise in Alaska and is operational…without ANY problems!!! So, as the retired SMSGT above said…Experience DOES count! You wrote: “I flew twenty-one years in Boeing products and consider them superior”. Superior to what? I presume you mean their Airbus counterpart? How many years of experience do you have with flying Airbus or more specifically KC-30’s? The US Defense Department / USAF is undoubtedly able to assess the merits of both proposals for tanker replacements on their individual technical and contractual merits. Reliability requirements could be written into the contract if considered an issue for either option (and probably will be anyway?). Just echoing Martin’s comments. Ray can express his satisfaction with Boeing equipment but how does that make him qualified to comment on Airbus? He mentioned nil experience with Airbus. I fly Cessnas and trust them but I would be silly to then say Piper or Cirrus aircraft are no good. This Airbus-vs-Boeing stuff is boring. And given all the dummy-spitting Boeing did over the tanker contest, I am suspicious of any anti-airbus talk I see on line – its too easy for one or two people to “bomb” a stack of forums. Lets talk about the Cricket or Global Warming or something else off-topic. Boeing KC-135R, Passing Gas since 1955!!! Hey Ray, great to see a old 305th AREFW boom is alive and well. So what wrong with getting an aircraft that is already proven? maintenance personnel are not doing any QANTAS training. Not since 2009 anyway. No currency training since then, not a good look for the RAAF. The maintenance personnel at that squadron are all trying to leave- bit of a sinking ship. They keep annoying us for jobs.